This review has not yet been approved by the owner of this writing service. If you are the webmaster of Dissertationcapital.com, please Contact Us to approve or remove this review. This website can best be described as annoying. A lot of links lead to one and the same page, there are a lot of garbage pages with nothing but filler, descriptions of service’s functions are vague at the very best. The most exasperating feature, however, is the one that is supposed to be the easiest to use – price calculator. Whenever you change the value of one box, it resets the values of all other boxes that follow it, which means that, for example, if you want to compare the prices per page for different deadlines you have to repeat the entire procedure multiple times. 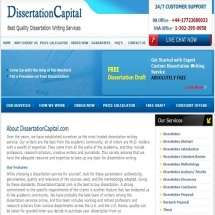 Despite being a service working exclusively with theses, dissertations and other big academic forms, DissertationCapital.com sports some astonishingly and suspiciously low prices. Price per 250 words starts at $18.95 and rises only as high as $34.95. There are a lot of companies that don’t sell high school essays that cheap. There are no samples of actual writing on the website, but its own content is atrociously poorly written – most likely, by somebody with only a passing acquaintance with English language. Refunds in case of proved plagiarism. DissertationCapital.com leaves an extremely unpleasant impression. Sloppily designed website, lots of filler, dozens of links leading to the same pages, tremendously annoying price calculator, facepalm-inducing grammar and syntax mistakes strewn everywhere, non-functioning customer support and ridiculously underpriced services – all this makes it look very untrustworthy. Taking into account the sheer inconvenience of placing an order with this company it is, indeed, surprising that they hope to attract any customers at all with this kind of a website.